"I find myself enmeshed in conflicts I do not understand, where both sides seem equally wrong." Good morning, friends, and I hope this finds you well. It's been a week since I posted anything here, and I feel like I should keep things current, even if I don't have much to say. This is my oldest presence on the world-wide cobweb, having been in my possession since the spring of 2011, sometimes active, sometimes dormant, always reflecting who I was at the time. Right now, I'm in another transitional phase. I don't do much besides write and play games in my retirement. Having worked for a solid fifty years, I'm tired of being "out," and my idea of a long trip is a walk to the mailbox. I blog extensively on my writing.com page, and those who have come here for my views on writing and writers should go there for that sort of insight. It's linked here. If you're more interested in my fiction, click on the Portfolio tab at the top of the page, and you'll find everything I share laid out for you to read. As to this page, what can I do to make it interesting to friends and inviting to strangers, strangers who might accept that invitation and become acquaintances, and dare I suggest it, friends? As I said, I'm enjoying my retirement by being a hermit, but I do some things, just mostly at home. You might say my retirement is taking the form of a long staycation. What I can offer here is a view of myself, and an invitation to converse, to join me in a judgment-free atmosphere and learn something I know, or teach me something I don't. So, let's get started! Drizzt Do'Urden came into being in 1988 when R.A. Salvatore was pressured on the spur-of-the-moment to create a sidekick for the giant barbarian Wulfgar, hero of his proposed series of novels based in The Forgotten Realms universe of novels based on Dungeons & Dragons. The outcast dark elf Drizzt struck a chord with the primarily teenage audience, and Drizzt took over the series that has spanned 29 years, and is still being written today. 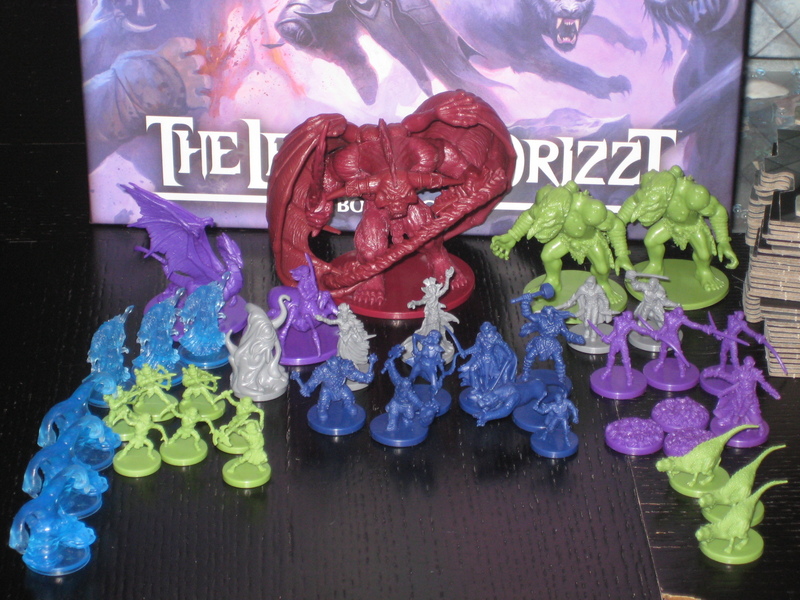 The Legend of Drizzt is a boardgame, part of a series of Dungeons & Dragons boardgames, that seeks to capitalize on the popularity of Salvatore's creation. It is a cooperative experience for up to five players. Each player assumes the role of one of the characters of the core group from the books, a band of heroes known as the Companions of the Hall. They are Drizzt, a magnificent dark elf swordsman, Wulfgar, the aforementioned barbarian, Bruenor, an axe-wielding dwarf, titular king of a lost kingdom, his adopted daughter Cattie-brie, an accomplished human archer, and Regis, a sneaky little halfling, which is a non-trademarked way to say Hobbit. All the action in the game takes place in the Underdark, a system of caves far deeper than ordinary caves, where the main dark elf society dwells, as well as a number of others, plus a wide assortment of monsters; most things found there, intelligent or not, are pure evil, and must be dealt with as the game system throws them at you. Therein lies the game. There is a very cool mechanic in which the players build the board as they go. The board consists of a stack of three-inch tiles which are shuffled and placed to the side. The party begins the game on one double-size tile, and each time a player moves off the edge of a tile, the next one is drawn from the stack and attached to the edge, causing the map to grow as it is discovered. 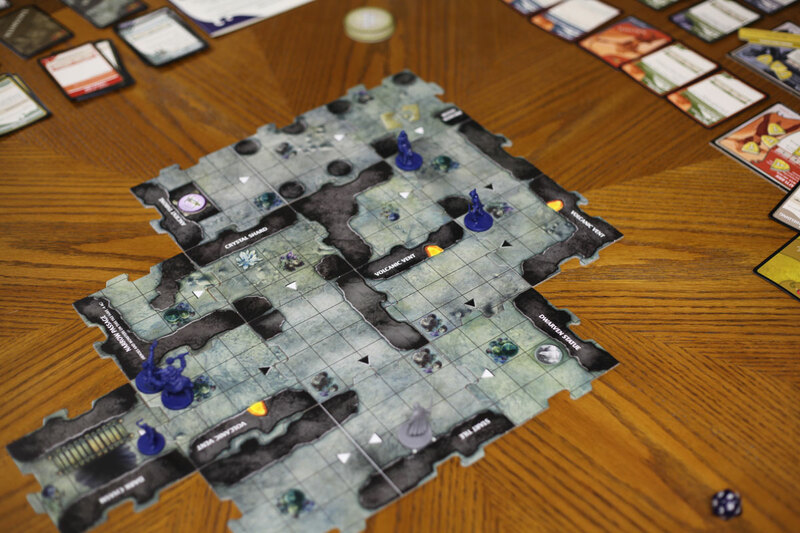 Each time a new tile is placed, a Monster card is drawn, and the corresponding goblin, troll, drow, or whatever is placed on the new tile, and attacks using the tactics specified on its card. The card is added to the hand of the player who drew it, and each time it is that player's turn, he first plays his own character, then the monster as if it were his own character. There are a number of scenarios that correspond to the stories in the early novels that are triggered by including Special Encounter tiles in the board deck, and when they are drawn, the real fun begins. As well as fighting monsters, the players can find treasure, heal a limited number of wounds, and have other, non-monster based encounters. And thereby hangs a tale. We played this game two or three months ago, and got our asses handed to us. We literally had a dead character, which is the condition for losing, by the end of the third turn. Everyone was content to put this abomination away, and write it off as a ripoff trading on a famous name. Everyone but me. I am a huge fan of Drizzt; his books are my favorite stories of all time, so naturally, I was determined to make this game playable, and if no one else would play it with me, I would solo it. Not much different than reading a book, really. So I got it out and began to tweak the rules. I tried various things to balance it, but nothing heavy-handed. Sure, I could have weakened the monsters to the point that they might as well not have been there, but there's no satisfaction in a game like that. I wanted a razors-edge balance where the players would usually win, but come away feeling like they had really done something. I experimented with each character making a dice roll at the beginning of each turn with certain numbers recovering a point of health for the character. I considered making the healing potions restore all of a character's life instead of half of it. I tweaked the monsters' attack dice. But at the end of the day, the game fixed itself. In each scenario, the party starts with a number of healing surges, usually two. When a character's hit points, usually between eight and ten, reach zero, you spend a healing surge and that character regains half of his starting total. Once the party is out of healing surges, the next character who reaches zero hit points dies, and ends the game in a party loss. This was happening with alarming regularity in our first games, and I suspect, though I don't remember, that we were doing something wrong, probably allowing every monster to attack on every turn instead of only on the turn of the player who drew its card. Whatever it was, I found a suggestion in the back of the rulebook that if the game is too difficult, give the party an extra healing surge. I decided that before I tried some tweaked system of my own creation, I would try that, so I set up a scenario with three characters and played it solitaire, following the printed rules meticulously. What do you know, it worked beautifully! So last Sunday we played two scenarios, the first where Bruenor rediscovers his lost kingdom, and the second in which he and his formidable friends drive out the dragon that has taken it over. We allowed three healing surges, and found that you can easily estimate the quality of your victory by the number of surges you haven't used by the end of the game. We used two in the first, which I would call a minor victory, and all three in the brawl against the dragon, which I have to say is marginal. Still, in the immortal words of Bill Cowher, "So what if we won ugly?" My conclusion is that if you have obtained what by all accounts looks to be a quality boardgame, and it doesn't play well, don't give up right away. Examine the rules; you may have made a tiny mistake that ruins the balance. If that doesn't fix it, consider your tactics; you may have adopted a losing strategy. Think about what you can do differently, and try that out. You may find a shining jewel beneath what you thought was garbage. I know I've learned a valuable lesson that I'm trying to pass along here, and given what people charge for boardgames these days, it is literally a valuable one. I would finally like to point out for those who play their games solitaire, by choice or through lack of local players, that this game lends itself very well to solitaire play. The first scenario is a one-player depiction of Drizzt's escape from the great Drow city of the underdark, and is an excellent learning vehicle. Be cautioned that when using one character, every monster is going to play in every turn, but that is not the norm, and it's easily possible to learn a very bad habit there. Once learned, though, the game plays very well solitaire by simply setting up the scenario and playing each character to the best of your ability. You won't have to fudge the monsters, either, as the tactics of each are dictated by their card. You can have a wonderful time reliving the Legend of Drizzt either with friends or without! If you have been living under a rock for the past six years, Downton Abbey was a period piece set at the beginning of the 20th Century that concerned itself with the lives of an extended family of British landed aristocrats, and their interactions with each other and their servants. I did not watch Downton Abbey in its first run. I was present in the room for the trailers, and what I saw was a deep, rich period piece whose characters had such earth-shaking problems to contend with as which cuff-links to wear for dinner, and who might be the most profitable aristocrats to marry their daughters. If I were designing a film to show in prison to torture the inmates, I'm pretty sure it would be close to this. Oh, how wrong we can be! It is our custom to watch various television series in order, one episode per night, over dinner. My lovely daughter got this as a gift last month, and it went into our rotation. It came up last week, and we will be watching the final episode of Season One tonight. Now, don't get me wrong; I still prefer Steve McGarrett racing to dump a hydrogen bomb out of a helicopter off the coast of Waikiki, but Downton Abbey is a different kind of animal. First of all, it is filled with intrigue both above stairs and below, as the British say. The servants jostle one another constantly for position and prestige, sabotaging each other's work, and going so far as to try to get rivals fired or arrested. Above stairs, the series begins in 1912 when this lifestyle is going into its final phases. The Titanic has just sunk, taking with it the presumptive heir to the Crowley Estate, and setting in motion a desperate scramble to put new safeguards in place. Scandals, blackmail, jealousy, and sabotage abound, all those things that make life in the aristocracy worth living, and the result is a show that keeps you hanging on every word and nuance. The Lord of the Manor, Robert Crawley or Lord Grantham to use his title, is a decent man who tries to be fair with everyone below him, but with this seething hotbed of intrigue playing out at every level, he is often caught behind the curve. There is the Lord, his wife, their three daughters and the various suitors, and close to a dozen servants, all with their own agendas. Add to the mix Lord Grantham's mother, the Dowager Countess, who has no real power but does have a real compulsion to meddle in everything she's aware of, and the recipe is complete. What I really appreciated was that with all these characters getting substantial time on center stage, they made no effort to tell you who to root for. Nearly at the end of the first season, I have gravitated toward Mary, the eldest daughter. Mary is headstrong and self-willed, things a woman is not supposed to be in that day and age. She is in many ways a symbol of the coming changes. 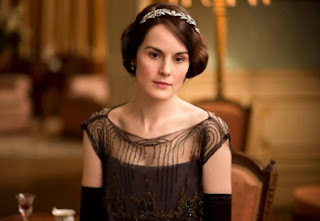 She is the future of Downton, as with no male heirs, whoever she marries is likely to become the next Lord of the Manor. I'm not a Brit, and I don't know if I have that part right, but a lot is riding on her. To her parents chagrin, she has rejected every suitor they have pushed at her, and done it in such a way as to preclude any chance of changing her mind later. Mary is a flawed character, sarcastic, and unappreciative of the way society treats her, and yet it seems the only way for her to rebel is to choose to live and die an old maid. She began the series being really nasty, but we have gotten into her motives, and I now have great sympathy for her, and am fascinated to see whether she can lay claim to her own life without giving up too much. The actress playing Mary has also caught my attention. 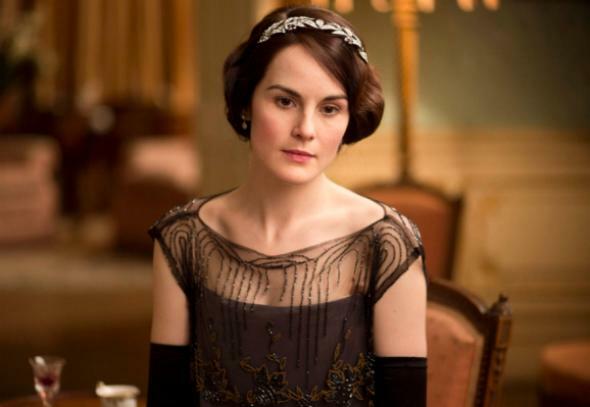 Michelle Dockery brings a visual elegance to the role that makes you instantly believe that she is a titled heiress. You would never believe her as one of the servants, but as the eldest daughter, she absolutely shines. Her voice is deep and rich with vibrato undertones that rivet your ear and make you listen; I've not heard an actress with a voice like this since Lauren Bacall. I don't know who trained her, but I wish he or she could train every actor on the screen. Her facial expressions and body language are absolutely appropriate to every nuance of every scene, and she can change the tone of any scene she's in with a simple shift of her eyes, or a curl at one corner of her mouth, making you wonder what unspoken underplot you've missed. She is magnificent. This is not to detract from the other actors. All have been carefully selected for their appearance and skills, and the production values are spot-on in every regard. You'll believe you are living in an English country house in every way possible. Here is my final testimonial: We are wrapping up Season One tonight, and will this weekend be moving on to another season of New Tricks, a British police dramedy. I like that show very much, but I will be looking forward to our next visit to the spectacular Downton Abbey. So, until next week, Play nice, watch out for one another, and take the time to watch some great TV! This week my plan was to add the long-awaited Chapter 13 to Stingaree, my novel of a Victorian San Diego in a steampunk universe. As with most chapters, four scenes go to make up this one, and thanks to the pinched nerve in my neck, I only got two sessions in. On the idea that that is a convenient excuse to duck a project I'm a little tired of, I'm going to shift gears next week, and work on my other work-in-progress, The Secret Society. That is a novella, and not arranged in chapters, but I'm looking to add four scenes to it, and it's set up so that you can view the progress and comment in real time. This is very much the first draft, and your comments could affect the story, so don't be shy! On the pinched nerve front, everyone knows that I'm getting older, and these things crop up. In about an hour, I'm leaving for an appointment with my physical therapist who I hope is going authorize a home neck-traction device for me. I have gotten considerable relief during the treatments I've received in his office, but it only lasts for a couple of days. With my own device, I could use it at-will, meaning every time this thing flares up, and while it will never be gone, my hope is that it will become something I can live with, like my dentures and my pre-diabetes. I'll add a footnote should there be anything worthy of reporting. Talk to you soon; have a great weekend! "One hates an author that's all author." And yet... And yet, in the face of such wisdom, this is what I strive to be. I've been having some indecisiveness lately over whether I want to be a writer any more. So I took yesterday off. Just, off. There are a number of things I do regularly on Saturday. I most generally write at least one review on writing.com, as well as promoting my group, the Punk Fiction Library. I also post links to the most recently active of my friends' blogs and pages on a daily basis, and I also routinely share a few items on Facebook, and comment on at least a half-dozen posts, and often many more. Yesterday I did none of those things, and as nearly as I can tell, nobody even noticed! For a certainty, no one commented. But the reality of it came home to me in the wee hours of this morning. I couldn't get to sleep last night. I tried. I laid in bed for an hour and studied the ceiling, the night light, and listened to the little owl that lives outside my window, and I finally gave it up. Taking my own advice that I give when this happens to my wife, I got up to make use of the time. Sitting down with no clear plan of what to do, I found myself working on Stingaree. It flowed so naturally that I actually invented (well, for myself, at least) a new way of outlining that gives me much more flexibility than my old notebook method. But that's neither here nor there; the point is that I want to write. I've been thinking about this turn of affairs, and what I've come to believe is that what I don't want to do is all those things I've obligated myself to over months and years, one little thing here, another little thing there, until all those little drops have added up to a sea. A sea of groups, forums, and social media that consume my writing time. I wake up early now that I'm retired. Don't know why. Maybe it's because there's nothing to dread after I wake, I don't know, but I have the house to myself for two-to-three hours when I first get up, and that is time that I want to write. But I have these other demands. I established a Facebook group, the Punk Fiction Authors Guild. It exists to help all its members, 25 right now, down from 31, and this means reposting their promotional material everywhere I frequent. Time off of my three hours. My daily scouring of friends' pages, then copying and pasting the links on writing.com. More time. Reviewing. Promoting and maintaining The Punk Fiction Library and Twenty-Five Words or Less. All time deducted from that immutable three hours. This blog. Riding the Blimp, my writing.com blog. Who knows what I'm forgetting in my sleep-deprived state? The point is that I have dug a crater with a teaspoon, and now I can barely see over the edge. The next thing I have to do in my writing life is to decide whether I'm going to be a writer, or a social media gadfly, posting, commenting, and pontificating on what it's like to be the writer that I'm not any more. I guess you can tell from the tone which way I'm going to go, so let me stipulate what you will and will not be seeing going forward. First of all, I will maintain everything I've started to benefit others. This specifically means the two groups and the forum that were mentioned above. I will maintain them. Don't look for me to be hanging out there every day, and commenting on everything that passes the gate. That isn't likely to continue. Reviewing and critiquing the work of others helps me keep my own style in focus, so I will continue to perform all my writing.com reviews on the weekends. There is one friend for whom I have agreed to critique her entries for a contest that is testing her skills over the next twelve weeks: I'm in. When I give my word, I keep it. Riding the Blimp will continue to appear each Monday, as preparing that helps me examine my Craft and I believe makes me a better writer. This blog I will continue to service when I think I have something to say, as I have done here. And that's it! Don't expect to see me all over Facebook or any of the other social media sites on a daily basis. I'll check out the things I started, and if they're running smoothly, I'll be moving on. What you will get in return is better, and more writing from me on such projects as Stingaree, The Darklighters, and The Nexus Chronicles. They will be offered up on writing.com for everyone's entertainment and opinions, and I hope you offer up those comments, because feedback makes you better at everything, and that includes writing. And on that note, I'm going to start my day, probably with a several-hour nap. Some of the grandkids will be over today, and I'll be engaging with them when I get up, so probably the next thing you see from me will be my Riding the Blimp blog on writing.com. I'll put up a link when that's done, and Tuesday I'll be launching back into Stingaree; that's been under construction for far too long! Until we meet again, play nice, watch out for one another, and above all else, get out there and live life like you mean it! Okay, I am back from my appointment, and as anyone who knows me already knows, there were problems. They used the home version of the traction machine to stretch my neck today, and trained my daughter and me on its use, but they want to do another week of observation before they actually let me take it home. That's all right, I can live with that, but we're here, of course, to talk about my little bug-eating plant... There were problems. The lousy soil these things live in in the wild is approximated by a 50-50 mix of peat moss and perlite. We stopped on the way home only to find that both these items are sold in 2-liter bags, one of which retails for $9.95, and the other for $6.95. $17.00 and tax seems a little steep to provide life support for a $3.00 plant, so it was determined to work with what we have for now. The first thing I did when I got home was to get him out of his mailing tube and trim the dead bits; there will always be some after shipping. With that done, he looked much happier, even being in his little plastic pot, which is a good thing, because he's going to be there for a while. He does have plenty of healthy traps, and by happy coincidence, we have plenty of healthy fruit flies this fine summer season. What we need to do is introduce the two, and that seems as easy as bringing them together. The next issue is the terrarium globe that I have available. Due to the height of the pot, it is, at five inches, just a speck too small for him to spread out in comfort, and you will see in the picture that the tallest stalks inside are touching the roof. I'm not about to mess with the pot, and the soil provided by the original seller, so the globe will have to be replaced with a larger one. I'm thinking an eight-inch to allow room for him to grow. I have a birthday coming up in just over three weeks, and I added a globe to my wish list. I'm thinking that will be done, because everyone wants to see this little guy make it. In the meantime, I have put the pot in the globe I have, surrounded it with model landscaping material, and hung it under the bar with the open side toward the kitchen. I fully expect him to be fine until I can get him a bigger house, especially after the flies find him! Which may have happened already. Two of the traps are closed. I can't really tell if there's anything in them, and I don't have an accurate fly census at this point. It's possible that I set them off during the move, but I'd swear they were open when I hung him up. Anyway, time will tell. I'm going to do everything in my power to help this little guy thrive, 'cause there's just something about a meat-eating plant that seems to compliment my personality. You might say that I've found my perfect pet! I sure hope he makes it. We have plenty of heat here, which they like, and being this near the ocean, the humidity is high enough most of the time. Bugs to eat? Check! What could go wrong? Today I'm back here to blog. You may be thinking that I said I wasn't going to do that anymore, but what I said was that there would be no more daily blogs about the minutiae of my writing process; it's time to get this back to its origins, fun stuff that I get up to. So, almost two weeks ago my four local grandkids, including second-in-command Venus, were over, and during the course of the day, a bunch of them made a store run. They returned with a Venus fly trap. There is some question about whether her dad or her aunt bought it for her, but that isn't the issue; I now have a meat-eating plant living in my house! What a simply horrid idea, right? Actually, deranged Victorian sci-fi lover that I am, I find them amazing, and totally cool. Venus, though, apparently doesn't share my enthusiasm, for despite several repeat visits since that particular purchase, and being reminded to take it home several times, it is still sitting on my dining room table. Her dad gave it some tap water (which they apparently hate) yesterday, but it's still here! Well, since the thing has been abandoned at my house, I perceive that there is nothing for me to do but adopt it. As luck would have it, I have a small hanging terrarium bowl whose resident plant died some time ago, and I have never done anything with it. As Venus fly traps don't get very big, it seems to be a natural fit. That will have to cleaned up inside and out, and some peat moss and perlite obtained for potting mix. Oh, and a bit of pea gravel for the bed. These little monsters have learned to eat bugs because the swampy soil they live in is too poor in nutrients to support a proper plant, and if you want them to do well in a terrarium, those conditions have to be duplicated. As luck would have it, I have a medical appointment for my pinched nerve today, and there are at least two nurseries between here and the office, so I'll be looking into that. Once I have this little guy settled into his (her?) new home, I'll post the pictures in Part II. That's it for now. Things to do, places to go, you know how it is. I hope to get our guest situated this afternoon, and Part II will land tonight or tomorrow morning. Be watching! "When writers die they become books, which is, after all, not too bad an incarnation." Likewise, if you are one of the small number who follow my demented ramblings, that's where you will find my public writings in the form of stories, books, a wee bit of poetry, and my weekly blog about the writing Craft, Riding the Blimp. You will find that there is much more to me over there, so pay me a visit, I'd love to hear from you! Oh, and take note, membership in writing.com is free, and members at any level have access to much more of my material than a guest on the site. And that about wraps it up. I may still post the occasional item here if the subject matter seems relevant, but anything I do in the way of daily activity will appear there. Well, I guess that does it. Hit the link and join the party! 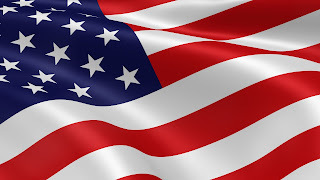 "A great people has been moved to defend a great nation. Terrorist attacks can shake the foundations of our biggest buildings, but they cannot touch the foundation of America. These acts shatter steel, but they cannot dent the steel of American resolve. America was targeted for attack because we're the brightest beacon for freedom and opportunity in the world. And no one will keep that light from shining." This is The Day, and before we go further, let's set aside our regional, political, and racial differences and take a moment to remember the victims and the heroes of that fateful day. I guarantee you that none of the firemen, policemen, and private citizens, some of whom gave the last full measure in those ruins, were looking at skin color or asking about someone's political leanings before pulling them out and heading for the exit. Is that what it takes for us to come together? Moving on to news of the writer, not much is going on today. I've designated Mondays as a day away from writing, a day when I catch my breath and refocus my thoughts before launching into a writing binge from Tuesday through Friday. I write a blog post on various aspects of The Craft to sort of clear my mind and explore my thoughts in those areas. Today I looked at using fear to enrich characters. Come have a read if that sounds interesting. Tomorrow, I'm going to throw away my outline for the last half of Stingaree, and rewrite it from scratch. I read somewhere that when a book seems to write itself, that is a dangerous indication that you are piling cliche on cliche, taking the easy solution to every question, and writing what will be a transparent and predictable plot. That is what has happened with Stingaree; I hereby promise that no matter what happens with my writing down the road, Stingaree will be finished, and it will be the best product I can produce. It may take a while longer, but I think it will be worth the wait. Let's start with a big party. Our favorite little steampunk elf Stephanie Kato attended the Long Beach Comic Con, and took a few pictures while she was there. I didn't count, but she says there are over sixty. A fun read indeed! William Jackson returns with Episode Three of his Atoms and Shadows movie review series, and believe me, that is always a ride. Immerse or Die looks at A Very Short Collection of Shorts by Rebecca Welch, while David Lee Summers announces upcoming book signings in the southwest this coming weekend. Finally, Metapunk has posted a thought-provoking article on how being a Dungeon Master has made him a better teacher. All of these items are worth you while, so it looks like you've got some reading to do! Play nice, look out for one another, and above all, keep safe, and I'll see you back here same time (more or less) tomorrow. This is my 100th post. Most bloggers try to do something dramatic to mark their "century" posts, and while I don't have some grand publishing milestone to offer up, I think this will qualify. I feel better today, physically, than I have in months. My arm pain is insignificant, and I don't know why; my last treatment was Wednesday, and I don't have another until next Wednesday. Mentally, though, my old demons are back in force. You will see below one of my writer friends talking about procrastination and writers block. This isn't normal block, where I could change it up by working on a different project. This is the nagging belief that I am wasting huge chunks of my life pursuing something I have already failed at. Do the logic: Next month I turn 69. I began writing to entertain others in fifth grade. In my twenties I polished my skills. In my thirties, I developed my voice, style, and presentation. In my forties and fifties I sought publication through every agent, editor, and publisher who would provide an address to send a query to. There were no takers. I became an independent author in my sixties, but that has the feel of going to a fantasy baseball camp; I may be able to show some of the other wannabes some tricks, but it ain't The Show. Now, leaning hard on 70, the question becomes, how much longer do I begin every day with three to six hours of intense and solitary work on something that is never going anywhere that matters? The simple fact is that if I was going to be a major "successful" author, it would have already happened. My wonderful daughter, who has never been one to mince words, and is a savage defender of what's best for her aging daddy, tells me, "This is your time, and no one knows how much you have left. You didn't retire to take on another job. If you don't feel like writing is filling a need anymore, then stop!" Even as a child, she had a way of cutting through to the heart of the matter. Karen Carlisle has run into a bout with procrastination, which you can take from me is just another form of writer's block. She has chosen to combat it by offering a short story from her archives. She's an excellent writer; take a look! Richard Schulte, the awesome photographer, is also a pretty decent author in his own right. Visit his story site and enjoy The Dog's Tail free of charge, and be sure to leave your thoughts; he's very deserving. S.K. Quinn offers a page of magnificent advice on how to launch yourself as a new author; yes, it involves spending some money, but I have yet to see a better plan. Also, Sarah Zama is interviewed by Book Shelf Fantasies on the suspension of disbelief, while Jonathan Fesmire offers Episode 11 of his Wild Steampunk Podcast. There's a lot of great material here, so settle in and enjoy your Sunday, and I'll see you tomorrow. Happy Saturday to everyone still locked into those nasty jobs, and I hope you're able to unwind this weekend. As most of you know, I don't write on the weekends. I shift gears to prepare for next week, and the new project to come. Next week, I will begin the outlining for my new project, a novella in my Nexus universe of supernatural warfare. I don't know what it's going to be about yet, and I don't expect to get any actual words on the page, but when I do, it will begin to appear on my page at writing.com, and it will be available for reading by members only. Not to put too fine a point on it, but those wishing to read it will need to have their FREE writing.com membership in place; either that, or buy it on Amazon whenever it's finally published. Here's something you don't need a membership for: Just because I'm not writing doesn't mean I'm not engaged. One thing I do on the weekends is reviews for my fellow writing.com members, and today I found a splendid little horror story that I can whole-heartedly recommend to anyone who enjoys that genre. The Devil's Bride was written for a contest, which it most deservedly won. Drop by when you have 15 minutes, and treat yourself to a delightful little chill. Lots of interesting blogs on the feeds today. 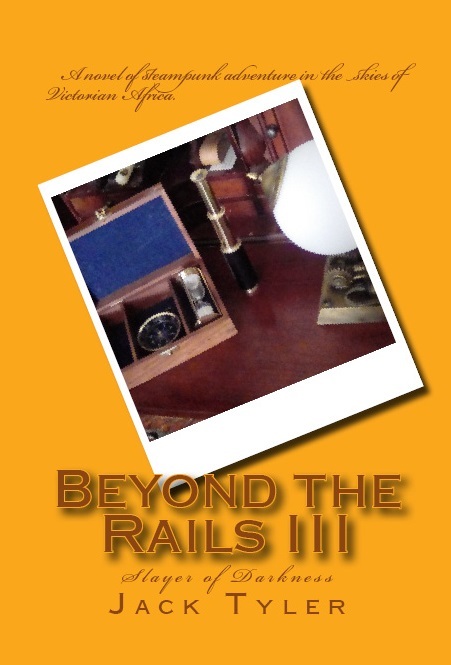 First, Andy Graham interviews my friend and talented author C.W. Hawes. C.P. Lesley turns her talented eye on the limitations of researching historical data. Writers Helping Writers has posted a most excellent article about how a character's career should affect their, well, character. Finally, David Lee Summers chronicles his visit to the New Orleans Pharmacy Museum. 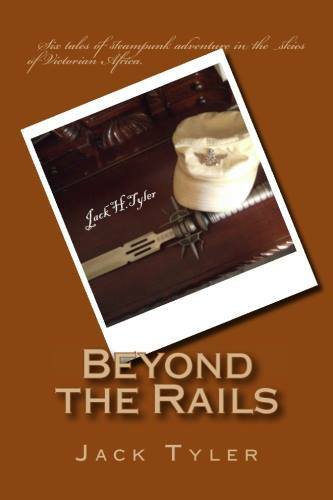 All good reading, and good information for period writers of all kinds. Everyone keep safe, play nice, and above all else, get out of Florida! I'll see you all tomorrow. Today I added another scene to The Secret Society. I was only able to get two sections done, but thanks to the new journaling method I've been raving about in the last few posts, they are light years ahead of what I originally had planned. I invite you to take a look; it is public access at the link above. Having learned a lot about my writing style over the last 58 years, I generally shift projects on a weekly basis, and this week will be no exception. Over the weekend, I will be writing a couple of reviews for my fellow writing.com members and prepping my blog post for that site. Monday, I will launch into the second story of The Nexus Chronicles, my supernatural 1920s series. This will be my first look at what the second story will be, so I'm not likely to get any actual writing done next week. What I hope to accomplish is to decide on the subject, the plot, and get a minimal outline completed so that I can start writing on my next session, maybe the week after. On today's feed I encountered Immerse or Die with a review of Toby Smart. Immerse or Die is a ruthless review site that allows an author two mistakes; on the third one, the reviewer pulls the plug and writes his review. Only the bravest authors submit themselves to that crucible, and not all survive! Michael May's guest blogger expounds on Nightmaster, DC Comic's foray into Sword and Sorcery, while steampunk author Karen Carlisle begins "Tea September" with a photo essay. There's some enjoyable stuff here, so be sure to pay them a visit, and I'll see you guys tomorrow! Good afternoon. As you can see, I'm still polishing the details. Also, this is much later than my usual posts, so I want to let everyone know that this is the new usual. I have begun using the "Journal First, Write Second" technique first described by Sue Grafton, and that means that I write while I'm fresh, and only move to this peripheral business after my real work is done. How is it working? Well, I added a new scene to The Secret Society this morning. Consider yourselves invited to stop by and see for yourself! Today brought quite a flurry of interesting blog posts. Alice E. Keyes shared an interesting writing exercise in which she was given the first and last lines of a story, and had to fill in the middle. Michael May's Adventure Blog begins a series of podcasts in which he and his friends examine and compare the seven King Kong films. As a footnote, if you find this page interesting, I suggest you bookmark it. I've left several comments over a period of months, and he answers everyone but me. I don't know whether he's angry with me, or finds me uninteresting, but either way, I'm not going to support him for too much longer if he continues to ignore me. Writers Helping Writers offers a method for countering the fear of creating, or more accurately, the fear of letting others critique what you've created. Professional editor Lynda Dietz completes her three-part series on superior written dialogue by slamming oddball speech tags. Finally, Sarah Zama has waxed profound about Tolkien's The Hobbit. I didn't know that after he completed the much larger follow-on work, Lord of the Rings, he rewrote The Hobbit to bring it into line with the larger work, and in the process made it a much darker tale which he then declined to publish. You hear stories about things like that all the time, and wonder what it might have been like. No need to wonder here. Sarah has included a link to it in her post! And that's thirty for today. Be safe, get ready for the weekend, and above all else, read well and write better! Good afternoon. Sorry I'm late, I just got home from physical therapy, which I think was a good investment, hence the late start. So yesterday I linked the Writers Helping Writers post in which the host talked about Sue Grafton's technique of Novel Journaling. I said I would look into it, and proceeded to do so. Today I tried it for the first time, and I am so blown away it isn't even funny. Most of you know that I've been writing in various formats for 58 years, and when I think about where I could have been if someone had shared this with me half a century ago, it almost brings me to tears. In the hope of opening someone else's eyes before it's too late, I'm going to share my experience here. I realize there are a lot of people, the majority I suspect, that are going to say, "I don't need any new techniques; I already know what I'm doing." It's human nature. I almost did it myself. I hope you don't, because the winners are going to be the ones who really look into this. For all of yesterday's big talk, I managed to get half of a scene written. The pain in the right arm is back; maybe that's the distraction. I have a course of treatment coming up over the next few weeks. We'll see if the one improving condition spills over into the other. More procrastinatin'. Did a little organizing, not much. I have an opportunity to re-establish the habit tomorrow. Mustn't waste it. I did, in fact, get some things done the following day, but they took the form of reviews, a blog post, a short-form poem, and talking with some of my author friends. What you read above, verbatim entries in my journal, amount to a chronicle of failure, a list of excuses for what I failed to accomplish, and a never-fulfilled promise to do better tomorrow. It's a litany of here's how I didn't with no corresponding plan for how I will. This is my first day of attempting to journal like Sue Grafton. The loud and demanding part of my mind is demanding that I turn the computer on and get back to my routine. It will likely take it a while to learn that this is the routine. My arm (from the pinched nerve issue) is acting up pretty severely, but that's all right. I'm going in for a physical therapy session today, which is also why I didn't schedule any writing to be done. The project I have set up to work on this week is the first story in The Darklighters, my Victorian Man From U.N.C.L.E. series. The two agents, Jinx and Smith, are in Hong Kong to prevent the assassination of the British trade minister by Kraken. The original working title was The Hidden City, and I've been stalled trying to work out where and what said hidden city might be. Having since changed the working title to The Secret Society, I have found this problem has disappeared completely. Lesson learned. With no scene to write about today, I will instead give my first impression of this method. It is fabulous! I got up and without tuning in to the chatter, launched directly into writing with a clear head. My mind is focused on that writing, and would be tuned in to the very scene I had scheduled to write. My only regret is that no one turned me on to this fifty years ago! Had I not had an important appointment today, that last paragraph would have consisted of a left brain - right brain discussion of the upcoming scene, and I would have sat down at the keyboard with both hemispheres warmed up and running at peak efficiency. I cannot imagine how I was ever able to write so much as a grocery list before discovering this method. This is too good not to share, and I sincerely hope that you get as much out of this as I did. For those who choose not to look, well, your choice, I guess. In other news, infrequent blogger Naomi Rawles has shared a post about the good things that ensue when you clean out your files, and prolific author C.W. Hawes makes his case against the frenetic pace and shallow characters of modern fiction. Both of these are worthwhile and thought-provoking reads, so click on over and exercise your minds! For dessert, ease back with Richard Schulte's coverage of a wonderful tribute to a 9/11 hero, then go take a hike with Sandy, a.k.a. Doris the Great as she hikes the 1000-foot mountains behind Lark Bay, Newfoundland, trusty camera in hand. I guess I could have put the Riding the Blimp news down here, but I wanted you to see it first. I have nothing additional today, so let's establish a parameter before we get to that point. How about if I make Riding the Blimp about things that I personally am involved with, and reserve this section for things like Cons, Book Signings, and the like, whether I'm involved or not? Opinions? Okay, then, happy hump day. CAMELS, FORWARD, HO! The obvious news is the revamping of the blog. Journaling about my day-to-day writing activities has proven about as interesting as watching corn grow, and I must move on from that if I hope to keep any readers at all; according to my dashboard, this has not been that popular. Still, this is an author's personal page, and there are those who want to know what to expect in the worlds of his creation, so this section, which shares its name with my writing.com blog, will chronicle my writing activities. Today, Sarah Zama marks a year of her Gang Roundup feature on her blog, The Old Shelter. Writers Helping Writers, a site that should be on every author's speed dial, has posted the single most valuable piece of advice I have encountered in my 58 years of dabbling in fiction, how to use a novel journal to make breakthroughs. I will be studying this thoroughly, and putting that beautiful journal I've mentioned before to good use henceforward. You should, too! Steampunk Cavaliers has dropped an in-depth review of Sunless Skies, a steampunk RPG set to run across all home computer platforms. 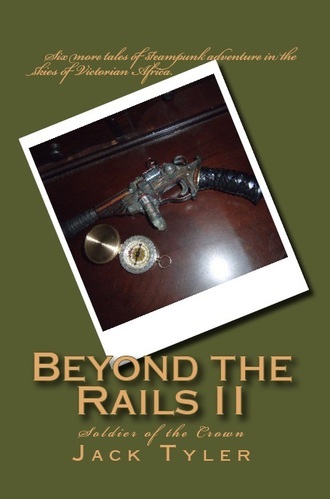 Finally, William Jackson, author across multiple ~punk genres, has posted his second set of two movie reviews on his page, The Railbaron's Blog. His format is one atompunk movie, and one noir. All of these are highly recommended. Entertaining, informative, and a great chance to make some new friends. When I have something else to share, maybe a blog post from elsewhere, or a special piece of news, it will appear here. Today there isn't anything, so I'll bid you good day, and await your comments on what you think of this format. Bear with me, I'll get it. Fair winds and following seas; I'll see you tomorrow! Good morning, my dwindling crew of friends and followers, and I hope this finds you well. Today's activity consisted of blogging at writing.com on an embarrassing subject, and one I probably shouldn't have shared... Or maybe I should, since people are known to read the book I refer to, and they'll be happy to know that I've learned from the experience. The only other writing endeavor I'm looking at today is to sort out where Stingaree is going. The grandkids are in school today, and... oh, no, this is a holiday! Well, hopefully I can make it work; I'm sure they have other plans. Happy Labor Day, by the way. Which brings me to my real point: Maybe this isn't the place for this journal. Looking at my dashboard, I can see that every day since I began doing this, fewer and fewer people have come to read. What I'm recording here is information that is of importance to me, and not to anyone else. Perhaps I need to get back to that paper journal, and make this into something more interesting. For one thing, this is my author site, where people land when they follow my link in my books, on Facebook, on writing.com, and everywhere else. This is my face to the world. Perhaps I should make it interesting to the world. So that's where I stand right now, at yet another crossroad. I'm not worried about it, and I hope you aren't either. All of life is an experiment, right? We'll have to see where this one leads. Didn't get beans done on Stingaree yesterday. Of course, I had a house full of grandkids. What would you have given your attention to? There'll be other days to write. Like today. I sent a lengthy writing.com review to a story called Rebuilding after Loss. It was written to the constraints of a contest's prompts which hurt it, and as I said in my review, the title could be on the front of a FEMA pamphlet, but there is a good new author shining through under those handicaps, and I wanted to let her know it. I received a five-star review of Brass and Coal which included some questions, so there was a conversation to be pursued there. I still need to assemble my post for tomorrow's Riding the Blimp entry, but it's just after noon here, so I have time to take a break, which I intend to do. How about you guys, anything exciting going on this Labor Day weekend? Saturday, first day of the weekend. The weekends are generally when I take care of my "administrative" writing, by which I mean reviewing, outlining, and the like. Today I reviewed a magnificent story, The Garment, by S.R. Wilson. This is a delightfully chilling tale written in the style of H.P. Lovecraft, and is really worth a look by horror fans. From there, I went to Twenty-five Words or Less, a micro-poetry page, and posted Disaster, a 25-word epic that is nothing like the title sounds. Aside from updating the Story of the Week in The Punk Fiction Library, that is all the keyboard work I have planned for today. I will be spending some time planning where to take Stingaree, but that's pencil-and-paper work, and I'll let you know how that went when I'm done. Everybody have a safe and sane three-day weekend, and I'll see you back here tomorrow. An odd footnote: Labor Day is traditionally the last holiday of summer. Here in San Diego, where the three seasons, Spring, Summer, and Fall, traditionally run a month or so late, we're just getting started. The thermometer in our driveway hit 116 degrees yesterday (I wouldn't have known that if I couldn't see it from the kitchen window), and we're promised more today. I have a lot of Scandinavian and northern European in my genetics; big fan of Spring and Fall! Good morning, readers and writers, and I hope this finds you well. Arm pain has been light to moderate this morning, which has allowed me to get quite a few things done. Specifically, I gave my Talk of the Flightdeck Award on writing.com, promoted Twenty-five Words or Less, something the more lyrical among you might want to look into, managed to get a blog post up on GoodReads, but most important of all, I completed Chapter 12 of Stingaree, and it's now ready to read. I change my pace on the weekends, mostly doing reviews for writing.com members. I am at the halfway point of Stingaree, and must now choose between several mutually exclusive directions I can take it in. Meanwhile, next week, I will be working on The Hidden City, the first story of The Darklighters series. Sorry, but I'm not going to release that for public scrutiny until the whole first draft is finished. After that it will be available for comments and suggestions. The Hidden City is a working title that will almost certainly be changed. I'm not in love with it, but it's a good name for record keeping purposes. I'll let you know when I find a boffo, show-biz title. You guys be nice, be good, be safe, and I'll see you back here again tomorrow.